Nowadays, almost everything we do is with the purpose of providing the maximum amount of comfort for ourselves. This comfort also includes our psychological well-being. But since we all have to face our negative emotions, this isn’t easy. So what should we do? Don’t pay them any attention? Accept them? Suppress or even release them? Buddhism – is a philosophy, that develops positive thinking. 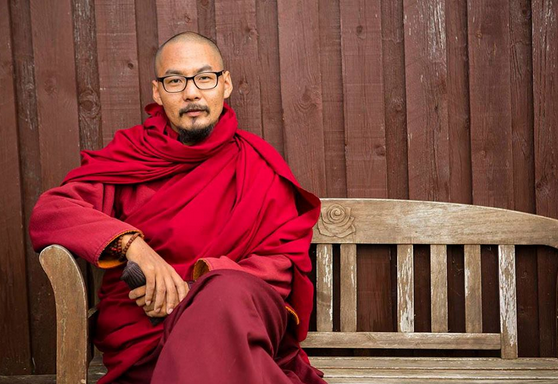 We spoke with Khenpo Karma Gyurme, a buddhist professor and Shedra’s (college) senior teacher of Buddhist monastery “Ka Ning Shedrub Ling” about these issues. These are the emotions, that make us suffer and do stupid things such as: anger, passion, judgement, selfishness etc. They disturb our mind and lead to improper actions. On the other hand, positive emotions, even though they don’t cause misconducts, they still can be harmful. For example, you are enjoying delicious food and it gives you pleasure. But at that moment you are happy not only because of a tasty meal, but also because you are healthy, surrounded by nice people with nothing that bothers you. You feel good in the moment, everything is beautiful, you are happy. You will associate this deep, strong experience of happiness with this particular meal and will try to look for it again. You may repeat this experience – go to the same restaurant, order the same dish and anticipate: happiness, where are you? But you won’t be able to recreate the same conditions and will most likely be disappointed. It’s as easy to be happy, as it is to be irritated. It is common for the mind to experience these emotions. When they happen, it’s difficult to keep control over oneself and keep a calm mind. That’s why positive and negative feelings are quite similar. But when the mind is equanimous, then it becomes easier to manage and control it. You will always be dependant on what is on the inside and not on the outside. Therefore don’t allow your mind to be drawn into these things. Can negative emotions be useful? The answer is: when emotions are controlling us – they are harmful. When we are controlling them – they are useful. For example, we need emotions like passion and desire for development; let’s call this thirst. Thirst for pleasure and achievement. If it’s not under our control, it will grow and tell us how to live our lives. People identify it with themselves. But that depends on who has control and how much of this thirst you need. Decide who is the boss. Who has the upper hand: the thirst or you? When you start realising this truth, it becomes easier to change your perception in everyday life. For instance, you won’t be craving to go shopping, because you already know, how much you need to be healthy and comfortable. It doesn’t mean you have to become an ascetic and give up everything. You can learn how to control your desires and realise whether you really need certain things or not, or whether you need to attain certain achievements or not. We can use emotions and feelings either wisely or foolishly. Generally, emotions decide our comfort zone. We often have aversion towards things that are outside of it. For example, if somebody says nasty things about you, you get offended and irritated. But why do you get angry? Which part of you is against it? Why do you think it is bad? The idea of negative emotion itself gives you a chance to have a look at it, investigate the nature of your ego, analyse the state of your mind. This is the way to use emotions wisely. When you start relating towards feelings this way, you will discover new aspects of yourself and your illusions. By eradicating them, you are broadening your comfort zone, and thus becoming less vulnerable and more satisfied with life. You said emotions determine our comfort zone. But they can be useful when it comes to our safety. They tell us when somebody is crossing the line. Emotions are a self-defence mechanism, aren’t they? That’s correct, but let’s look at it from another perspective. Fear. There are different kinds of fear. Some have to deal with loss: money, property, reputation, friendship or people’s respect. Today, this is happening more and more. As a self-defence mechanism we are becoming the victims of our own fear. It’s normal to keep the door closed. But that’s strange when you have a fence and five locks on it. This is what our mind does: having too much concern about safety and building barriers. If you need to unlock five doors to get into the house, that’s not a home, but a prison. How to create balance? Observe your mind. Let’s get back to the example with the door. Supposing you have one door. You start thinking: did I protect my house sufficiently? Should I put an extra lock? Observe these thoughts, analyse them: why do they arise? Do they have an actual background or is it just a fear? Why don’t I trust the space around me? What is positive thinking according to Buddhism? Positive thinking can have different goals. According to modern beliefs, it is an antidote against unpleasant emotional states. Such thinking only gives temporarily results. For instance, you can be free from depression or negativity for a short, or sometimes long time. But it’s not the path of wisdom, that’s why the effect of such little achievements will sooner or later end, and therefore maybe not in this, but in a next life, you will definitely face these reoccurring emotional states. Buddhist positive thinking is based on wisdom, that recognises the true nature of things. We usually see the world as something solid, material and important. The Buddhist way of wisdom helps to look at it from another angle. We start seeing everything differently. When the perspective changes, we stop paying attention and spending energy on things that made us suffer before. Turns out, it is a kind of positive thinking, we could say, a positive perception of the reality. With this Buddhist way of thinking, even hard times in life won’t look that scary and awful. The nature of it doesn’t change – the perception does. We can say, that negative states multiply easily. Adverse feelings can cause others to arise. When you are angry, for example, envy and jealousy can accumulate. These are already three negative emotions! When we are negative, it’s sometimes impossible to define how we feel, because of the feelings being mixed up. One of the essential distinction between Buddhism and other positive thinking systems is that it teaches us to see the causes and their origins. It helps to study and investigate its development. It is a logical and fundamental approach, and not a trap for the mind. If you just pretend to behave like there are no negative emotions – it’s not going to work. If you patiently begin to contemplate the way it works, arises and passes – you’ll win. And it will be a genuine Buddhist positive thinking approach. How do you suggest to deal with negative emotions? First of all, realise that emotions – are not you. It’s very hard to do so. Even linguistically we always say: “ I’m angry, I’m irritated ”. You need to understand, you are not your emotions, they are apart from you. Don’t take them too personally. Second, think what this or that feeling will accomplish. For example, you are very mad. Stop for a second and see: what will the anger lead to? Will it be useful for me? What is going to happen if I do what anger tells me to? Will I be happier? If you don’t, on one hand , you’ll be able to control your decision making. On the other hand, during this self-analysing time, the emotion will weaken, lessen and your actions will be less destructive than they would be. Don’t think that only negative emotions are harmful. Positive emotions can be pleasant, but they are also just a form of mind attachment. By this I mean, joy can be unhealthy too when it tries to manipulate us. Be cautious, recognise and analyse your emotions! Finally, keep on practicing awareness. It won’t be easy. At first you’ll see that the emotions are stronger than you. After you’ve planted the seed, it will take time for the fruit to grow. Be patient and persistent, try not to be upset. You live to learn! Thank you Khenpo La for an interesting and informative talk! Now Ukrainian representatives of Rangjung Yeshe together with Ka Nying Shedrub Ling, where Khenpo La lives and works, are building a Buddhist Retreat Centre Jangchub Choling in Zhytomyr region in Ukraine. Jangchub Choling is not only a future retreat centre, it’s a place, where you’ll be able to learn Buddhist philosophy, meditation from a lineage of authentic teachers, participate in retreats, and have a spiritual practice under master’s supervision. Now the centre is being built, and Buddhist community Rangjung Yeshe will be grateful for any donation. Generosity in Buddhism – is one of the greatest virtues, that is the main background for a happy present and future lives. No matter if you believe it, or not.